You might think you recognize the Rolling Stone quilt block as it seems so familiar. Well, you are right -- it is made of all the same components as the Rolling Pin block, but the some of the patches are placed in a different direction, and the placement of the colours makes all the difference in the new look of the Rolling Stone block. This quilt block uses a familiar patch -- the flying geese unit and also makes good use of the less common patch -- the square in a square. 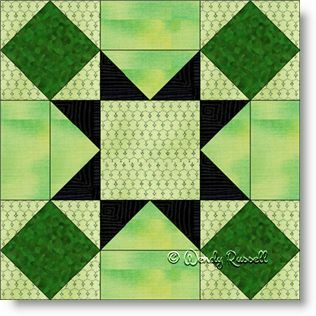 The sample quilts illustrated show settings of the blocks side by side as well as on point with additional blank blocks to show off your quilting skill.